Welcome to the second post in our “Winning in a Winter Wonderland!” blog series! 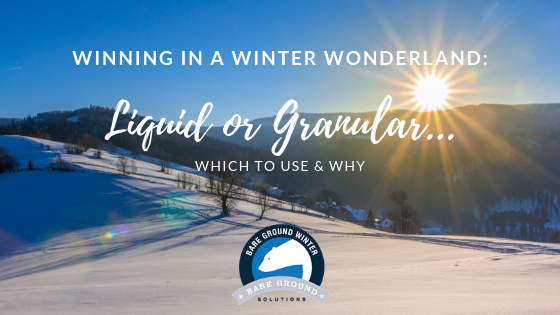 Bare Ground knows its important to understand the various ways to beat ice and snow – what products to use, when to use them, how to apply them, and so on. With all this information at your fingertips on granular ice melt and liquid ice melt, winter will have nothing on you! In the first post of the series, we talked about MagPlus, Bare Ground’s liquid magnesium chloride ice melt. It’s a USDA BioPreferred product, and one of our favorites – especially for households with pets! However, you may notice that when you’re out in the stores, one of the most common forms of ice melt is actually granular. So…how do you know which one you should be using? Should you be using both? There are clear benefits to both liquid and granular ice melt. Both will effectively remove ice, but the best choice for you really depends on your needs and goals. Let’s take a look at the top 5 benefits of both forms of ice melt. When it comes down to making your decision about which form of ice melt to use at your home or business, there are four main factors to consider. Before making your purchase and combating the snow and ice, take stock of location, duration, protection, and application. Take inventory of where ice accumulates on your property. Does it occur in concentrated areas, or is it more wide spread? Are they more thick patches or thin sheets of ice? How long is the weather or cold snap forecasted to last? If it’s a long storm, dilution and application will be important. What is important to protect? Do you have new brick hardscaping or gorgeous plants and shrubs to protect? Do you have furry family members with sensitive paws? If so, Bare Ground’s MagPlus Liquid Ice Melt is the better choice for you. Who will be applying the ice melt? Does the weight or method of application make a difference? Looking at the benefits of each kind, and taking the four factors into consideration, you will be well equipped to make the best ice melt decision for your property, protecting all of the lives and landscaping you hold dear! Winter has begun across much of the United States, and as we try to clear our driveways and walkways of the beautiful yet dangerous snow and ice, there are often questions of what product to use, when to use it, how to apply it, and so on. Wouldn’t it be nice to wave a magic wand and have it just disappear?? Well… you can. But more on that later. 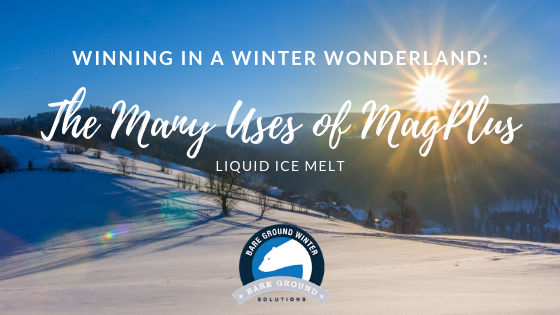 Today we’re kicking off a multi-part series on how to beat ice and snow called “Winning in a Winter Wonderland!” We’re starting by talking about the Bare Ground’s MagPlus liquid ice melt and how it’s not just for after the storm! A USDA BioPreferred product, MagPlus is environmentally friendly Magnesium Chloride blended with a corn-based corrosion inhibitor that is safe on all surfaces and around pets and plants, making it a popular choice for families with pets and beautiful landscapes. As a liquid ice melt, it is water soluble, and keeps melt water in a liquid state longer than granular ice melt products. In addition to its extremely effective and gentle nature compared with other products, MagPlus is also a multi-use liquid ice melt. 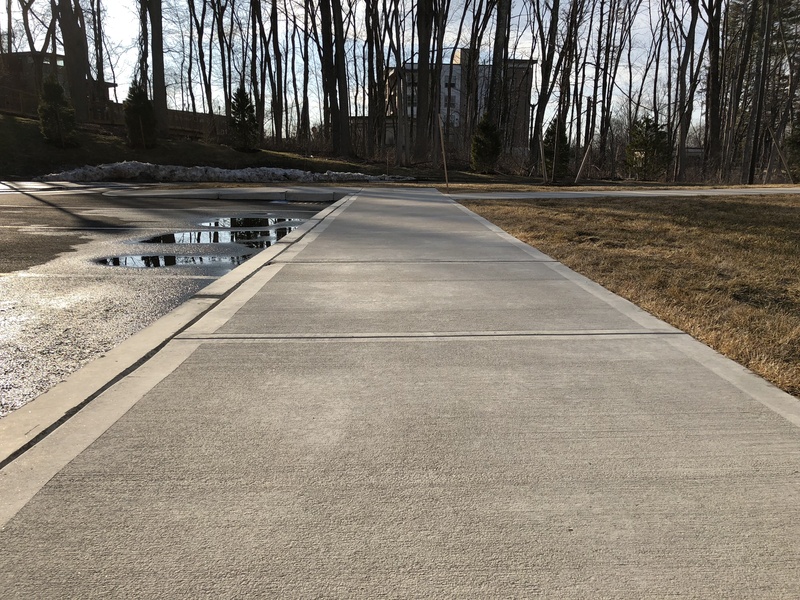 In the hours before a snow or ice storm begins, MagPlus can be applied to a bare surface which creates a non-stick surface. The application of the mist makes for an easier removal of ice and snow, and helps maintain safer grounds and walkways. This particular use of MagPlus is awesome in areas that remain extremely cold for long periods of time. Once the storm begins, MagPlus can be used at any time to reduce the accumulation of the event by up to as much as 3”. The impact with this application depends on the level of humidity present in the snowfall and the ambient outdoor temperature. For example, increased water content in heavier snow can inhibit the reduction effect of MagPlus, where the coldest snowfall temperatures with very low water content in the snow will see greater reduction in accumulation. Regardless of the snow’s moisture level, if the snow storm overpowers the reduction effect, the application of MagPlus maintains it’s non-stick qualities for easier removal! Once it has stopped snowing or depositing ice, Bare Ground MagPlus can be applied to remaining patches of snow and ice. This causes the patches to melt – even at low temperatures. With its multi-stage use, effectiveness, and less harmful qualities, Bare Ground’s MagPlus is the clear choice for homeowners and businesses looking to protect their property, pets, and landscape when clearing snow and ice! It’s that time of year again where ticks start to come out in full force. We’re happy that spring is FINALLY here, but the sudden onset of bites and buzzing is still a drag. We’ve been hearing for a month or so now that THIS is they year they’re going to be really, really bad. There are some staggering statistics out there, and none of us wants to be part of those numbers, but what do we have to know to keep ourselves and our loved ones safe from tick-borne diseases? First, let’s look at some numbers. The majority of tick-borne illness cases come from 14 states, one of which is our home state of Massachusetts. 87,000 people EACH YEAR are diagnosed with Lyme Disease here in the Bay State. Yuck. While both ticks and mosquitoes can irritate us and make us sick, the number of tick-related cases are much higher. So how do we guard against these pests? Prevention and persistence are key. When you’re going hiking or working outside, especially in long grass, wear long pants, and tuck them into your socks. Not a great fashion statement unless you’re reliving the 80s, but effective for keeping ticks off your ankles and out of your pants. Long sleeve shirts are also important as these pests like to drop from trees, too. Use some sort of repellent. At Bare Ground, we believe in effective, more natural and environmentally friendly options to keep ticks, and tick carrying animals, away from your home and your garden. Predator Urines and garlic are just two methods, but really, just protect yourself. Repellents can be applied, or even come built into clothing geared for the outdoors. Choose what’s best for you and whatever it is that you’re enjoying outside. 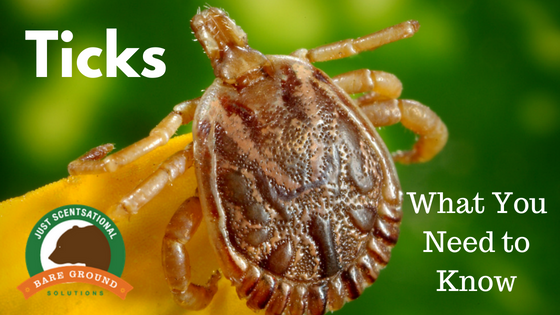 There are products that you can use around your home and in your garden to keep ticks, and tick carrying animals, away. Say that we prefer a less chemical, more natural approach like garlic to repel ticks or predator scents to keep tick carrying animals away. After you’ve been outside, always do a tick check. In fact, do one daily, especially on children. Check in places where they can hide – neck, hairline, groin, knees and elbows, and places where your clothes are tight. And shower after being outdoors. If you shower soon enough after exposure, ticks will wash right off before they really latch on to you. Feel your skin for any bumps that don’t belong. These guys are tiny, so sometimes your eyes will miss them! What IF you miss one? It happens. They’re really small and they hide. Know what to look for: fever, chills, headache, muscle aches. These 4 happen with all tick-borne illnesses. Sometimes these are also accompanied by a rash. Whatever you do, stay vigilant this season. The ticks are here, but if you are armed with all you need to know, they won’t have any impact on your summer fun! Asphalt Repair: Yes, You Can DIY! Winter is almost over and the snow is starting to melt away and we’re all looking forward to a warm spring. Have you noticed how your driveway looks after about three months of winter? Is it time for some asphalt repair? Potholes – When pieces of asphalt break off from the driveway, creating a hole. They can vary in size. This is often the result of unmaintained alligator cracks that are worsened by the winter ice. Alligator and spiderweb cracks – These are small cracks that connect to resemble the scaly back of an alligator or the loops of a spider web. Sinkholes and bird baths – Areas of asphalt that have sunk into the ground. This occurs when the foundation is not properly constructed. The base may be washed away after a while and when the asphalt is warmed by the sun’s heat it will form into the missing base. Smaller sink holes are called bird baths and are typically 1-2 inches deep. To have your driveway resurfaced by a professional, can cost anywhere from $3000 to $6000. Do you really have to resurface your entire driveway to fix some cracks and potholes? No! There is a much simpler and affordable way to fix parts of your driveway that need some minor repairs. If you only have some few cracks to fill, the BareGround One Shot Premium Asphalt Crack Filler (and Sealer) will get the job done very easily in one simple step. This ready to use filler is also a waterproof sealant which can repair and patch cracks up to 1-inch wide. This One Shot product fills and seals at the same time reducing effort, saving time AND money. For driveways with potholes, the BareGround One Shot Asphalt Water Based Pot Hole Repair will permanently fix in a jiffy. This unique product is specially formulated to cure and harden immediately with water to form a durable asphalt pothole repair. It is also eco-friendly, VOC free and solvent-free. Besides driveways, this compound can also be used in roads or parking lots. Pour the One Shot water based pothole repair mix into the hole and add water to create a solid and long lasting fix. Repairing your driveway shouldn’t be time consuming and costly. Simple DIY asphalt repair projects will keep your wallet happy and you will have more time for fun outdoor activities! What's So Great About Liquid Fish? Fish has been used by Native Americans as a natural source of plant nutrients for hundreds of years. The organic matter that the fish fertilizer provides breaks down and releases nutrients into the soil for plant strength and vitality, and also enhances the naturally occurring micro organisms in your soil. This means that you don’t have to use synthetic or chemical fertilizers that are the main source of groundwater pollution, AND the fish fertilizer is safe for people and pets. Trident’s Pride liquid fish soil enhancer by Bare Ground is a concentrated high energy soil nutrient broth that creates a superb foundation for building the best lawns, crops and gardens. We use 100% including the enzymes (this is not a scraps-only formula). In addition to the liquid fish soil enhancer, Trident’s Pride also comes in granular form for added soil aeration, making it easy to incorporate this natural fertilizer into your planting process from the very start! If you happen to utter the words “Ice Dams”, do you notice that people tend to cringe? Last winter was particularly brutal, and homeowners and insurance companies alike are hoping for the best, but preparing for the worst! Peter Marshall, owner of Marshall Insurance in Marlborough, MA said he and his staff processed claims for their customers all day, every day for six weeks during the end of last winter. “I fielded questions from almost everyone I encountered for months after that, as well.” Ice Dam claims in the Northeast last year alone cost insurers $1.8 billion dollars. And the issues for homeowners? Well, let’s just say most everyone who dealt with ice dams last winter will do anything to avoid them again this time around! But how can you prepare for Mother Nature this year? There are two main ways – preventative measures before winter approaches, and channeling water through ice and snow once your roof is covered! If you have more time and resources at your disposal, performing an energy audit is key to really knowing your home. This critical process will tell you if your attic is well insulated, and identify your risks for ice dams. But it is already December, and the snow will be here before we know it! Once snow and ice have built up on your roof, it’s the melting water that causes nightmares because it has nowhere to go but in… under your roof, down your walls and .. INTO YOUR HOME! Your first action is to make a channel for the water to leave your roof before it has a chance to back up under your shingles and soak on through into your home causing damage. Use safe and effective products to efficiently remove snow and ice from your roof! There are many products out there that can work to remove ice dams – but few can ensure they work the first time, efficiently and are virtually non-corrosive as to not harm your roof, and is safe or plants, animals, and humans on the ground below. When possible, choose compounds that are environmentally-safe, pet-safe, and virtually non-corrosive, like magnesium chloride with a corn inhibitor that Bare Ground uses in our new gel melts and other winter products. With a little preparation, you should be able to handle whatever Mother Nature blows your way this winter!